This quaint and cozy cottage is situated in the quiet and beautiful New Hampshire countryside making it a perfect getaway from the hustle and bustle of everyday life. The cottage shares approximately 33 acres with our classic New England farmhouse. It is located roughly 100 feet from the house and around 200 feet from our privately owned sandy beach on peaceful Lake Winona. The next closest neighbor in any direction lives around 500 feet away. A country road divides our property in two with the house and cottage on one side and the lakefront and beach on the other. However, the traffic is minimal because we are located in a very rural area. The beach is a brief walk across the street and down a modest hill from the cabin. A limited, but beautiful, view of the surrounding mountains and the lake is visible from the cottage porch. Beautiful private sandy beach located within 200 feet from the cottage door. Enjoy the picturesque view of the foothills of the White Mountains. We enjoyed every second of our stay. This place is just magical - healing, relaxing, and rejuvenating energy. Perfect scenes for nature photography lovers and active, outdoorsy people. We received authentic Five Star hospitality - would not ask for anything else, maybe a longer stay next time! I am so blessed to have met Daria and Thomas, Wonderful,Wonderful couple. I got so much enjoyment listening and hearing there true feelings of the beautiful area we live in. Would love to have them back any time. We had such a great time here! The locations is amazing, the lake is gorgeous, the cottage is adorable and Bruce is so kind. We will definitely be back!! Beautiful setting for a get away! Thanks, Bruce. We had a lovely get away. The lake is great for swimming and kayaking. Enjoyed seeing the nesting loon and its mate. The cabin was very comfortable and clean. We hope to visit again soon. Bill and Luella. We really enjoyed this cute little cottage facing Wynona Lake . Perfect place, great weather, on beautiful Wynona Lake and the landlord was the icing on the cake ! I am so forgenit to live on this little lake and share it with wonderful folks. When Mike and Janie arrived it was like we knew one another for years. Great people. I am sure they will be back. The cabin is located right next to the main house, seperated only by the paved driveway, so there is no seclusion or privacy. The "country road" you need to cross to get to the water is actually a well travelled two lane blacktop. The "screened porch" was filled with mosquitos when we arrived, due to the open gaps at both top and bottom. Once inside we went to hang our jackets on the wall hooks behind the door, only to see multiple spiders scatter from said hooks! Upon closer inspection of the cabin we found cobwebs and spiderwebs galore (walls & ceilings), mildew on the shower curtain, and a dirty stove top. On top of that, the bed was so short that even with my head firmly up against the headboard, my feet extended out over the foot board! I am tall, at 6' 4"......but, really? On a positve note, Bruce seemed very nice and pleasant over the phone, which, other than e-mail was our only contact with him. We loaded our stuff back up and left that same evening. Quite a letdown from what we expected after reading the reviews and looking at the pictures. In the country we do have mosquitos , spiders, chipmunks ,squirrels ,deer ,bears etc. I do not invite them but they are part of the country setting. If I know you are being attacked please let me know. On a serious note , if there is anything I can do to make your stay more comfortable please let me know . Just what we needed. The cabin was small and had the basic necessities. Used the oven and charcoal grill for kabobs. Beautiful lake Winona was amazing! We used Bruce's kayak twice. Weather was phenomenal day after day. Bruce was a great host, respected privacy, but closeby if needed. 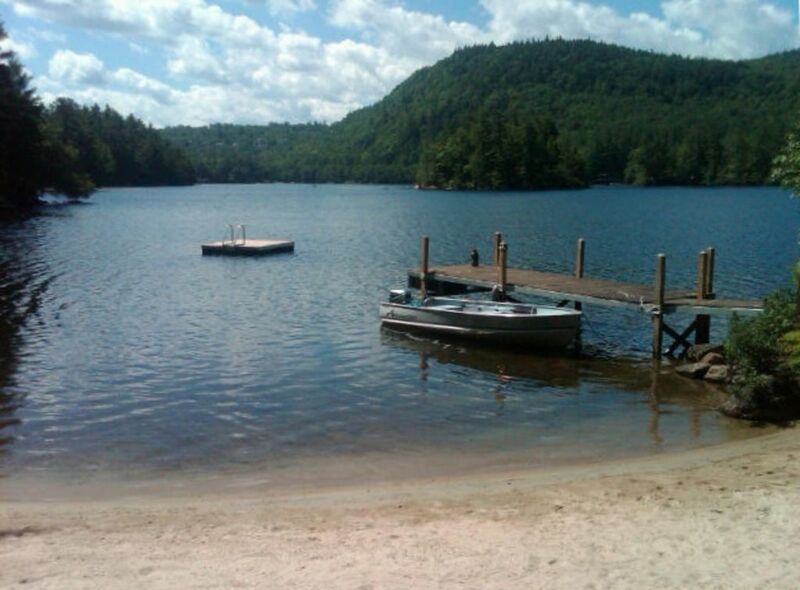 Cabin was approximately 1/2 hour from Laconia and surrounding towns...enjoyed our stay immensely!